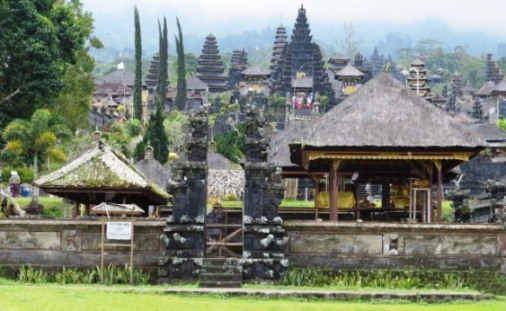 Pura Besakih is the most important temple and known as "The Mother Temple Of Bali". Became a witness to the culture development and keep the history of Bali from the ancient to the present. Besakih temple complex is perched at the slopes of Mount Agung, the highest mountain as well as very sacred and foremost for the people of this island. This holy temple is located at the District of Rendang, Karangasem Regency, Bali. Besakih temple opening hours at 8am - 5 pm daily. Visitor can access this place directly from Ngurah Rai International Airport, about 65 Kilometers (two hours). Let's take a closer look to the Besakih Temple! Besakih Temple Piodalan Anniversary that performed each year is called "Batara Turun Kabeh" . Batara Turun Kabeh ceremony is held every year at the time of the Full Moon in the Tenth Month of Bali Calendar or often called "Purnama Sasih Kadasa". The piodalan anniversary is an expression of gratitude to God for the gift of safety, health, prosperity devolved and spared from the calamities / disasters. The ceremony or piodalan anniversary at the mother temple of Besakih is usually carried out in a long period. This is done with the hope that the whole community both in and outside Bali can perform worship to the mother temple Besakih. The relatively long span of time also aims to reduce the queue of people who worship in piodalan anniversary especially at peak times. In addition, it also aims to reduce the burden of traffic congestion and parking efficient. Besakih temple piodalan anniversary is held at the Pura Penataran Agung Besakih. Pura Penataran Agung Besakih is the most important temple of Besakih Temple Complex. In addition, there is also other Besakih Temple ceremony called Panca Bali Krama Ceremony implemented once every 10 (ten) years and Eka Dasa Ludra Ceremony implemented once every 100 (hundred) years. 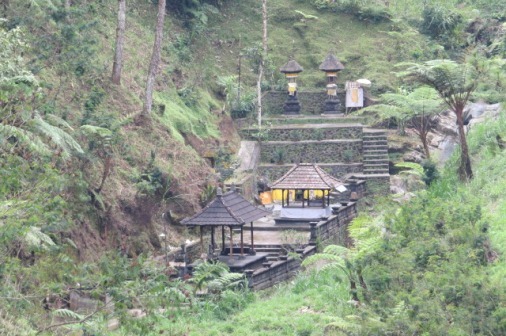 Besakih mother temple is a temple complex consisting of 18 groups of temple. Pura Penataran Agung Besakih or "The Main Temple" is the largest temple among the groups of Besakih Temple Complex. The Main Temple is arranged in levels up to (7) seven levels which known as "Sapta Loka" or "Sapta Patala". The visitor can step up through the stairs. Each side is decorated by the puppet statues from the charactes of Ramayana and Mahabharata epics. Level I. The main building at this location is Balai Pegat to invoke the "tirta" and purify the prayers before entering the temple. Level II. This level is the foremoust complex level of the entire levels. This level is the location of the main building or "Padma Tiga" serve as Stana Dewa Tri Murti consist of: Brahma, Vishnu and Ciwa. Level III. The important building in this location is "Gedong Simpen" serve as place to store pratima, inscriptions and "pangangge". Dang Hyang Nirartha statue also stored at this location. Level IV. 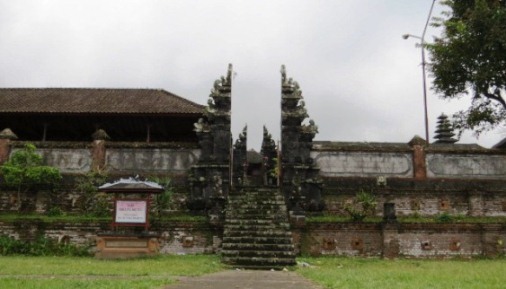 The important building on this level serve as Stana Ratu Semaring Jagat (symbol of power), Stana Ratu Subandar (ruler trade in water), Ratu Ulang Ayu (ruler trade on land) and Stana Ratu Sanghyang Surya Candra (Shiva Buddha). Level V. The important building on this level serve as Stana Ratu Sanghyang Wisesa (ruler of spiritual power) and Stana Ratu Ayung Mageleng. Level VI. At this level there is a twin building which serve as Stana Ratu Puncak Kiwa (left) dan Puncak Tengen (right) as a symbol of two opposing forces or Rwa bhineda. Level VII. This level is an empty land without building is often referred as "Sunia Loka" a symbol of the end and the beginning of life. Pesimpangan Temple take place in the Sub-Village Kedundung (Dusun Kedundung). 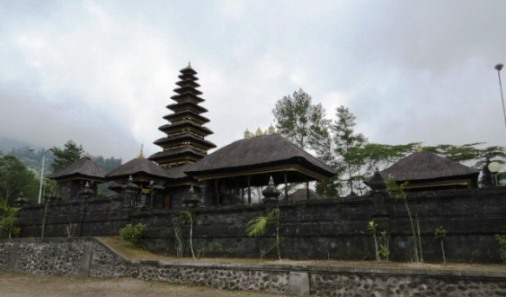 This temple serves as a place of temporary sojourn of Ida Bharata at Besakih when the Melasti Ceremony to Tegal Suci, Toya Sah, and Watu Klotok (Klungkung). Dalem Puri Temple is located on the west side of Pura Besakih. The Temple serve as stana of Bhatari Dewi Durgha Nini. 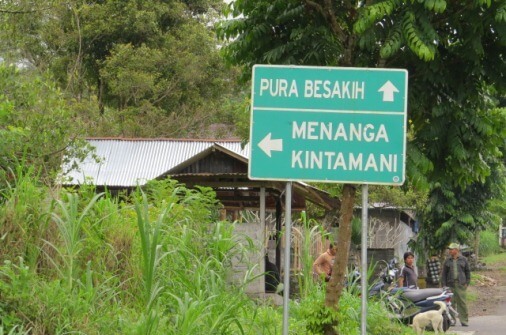 At the eastern side of this place is called Tegal Panangsaran. In the Southwest and Northwest are the source of sacred spring called Tirtha Sudhamala and Tirtha Empul. Manik Mas Temple is located on the western side of mother temple Besakih, precisely on the left side of the main road (Margi Agung). In this sacred temple there is a building called Gedong Simpen which function as sacred place or stana for Ida Ratu Mas Malilit. This temple has the purification function to the people who want to pray to Besakih mother temple, either "sekala" or "niskala". In addition, the temple also serves as a place to "Mapiuning" or requesting approval of ancestors (pitara) during the Nuntun Dewa Hyang ceremony. This temple is located on the right side of the main road (Margi Agung) to The Main Temple. The temple serves as holy place or stana of Sang Hyang Ananta Bhoga the symbol of world fertility. To the south of Bangun Sakti Temple on the banks of the river there is a sacred spring called Tirtha Padiksan and Tirtha Tunggang. Ulun Kulkul Temple take place on the left side of the main road (Margi Agung) to the mother temple Besakih at the eastern side of Bangun Sakti Temple. The main building is the Palinggih Gedong Sari serve as Stana of Lord Mahadewa with color symbols in yellow. Ulun Kulkul Temple including with Pura Batu Madeg, Pura Gelap, and Pura Kiduling Kreteg is called Catur Loka Pala. This temple serves as a holy place to worship for Amerta or welfare for the world. Merajan Selonding Temple on the east side of Ulun Kulkul temple. The temple serve as holy place or stana dor Shri Wira Dalem Kesari. This temple also serve as a place for Raja Purana Besakih (Bradah Inscription) and Gambelan Selonding was stored. Pura Goa is located on the south side of the main road (Margi Agung) to Pura Besakih, in the eastern side of Bangun Sakti Temple. This temple serve as a sacred building or stana of Ida Batara Rambut Sedana. To the south of this place, on the river edge, there is a sacred cave or Goa as a meeting place of Ida Batara Naga Tiga, consist of Naga Ananta Bhoga, Naga Basuki and Naga Tat Saka. Banua Kawan Temple is located at the west side of the mother temple Besakih. In this temple there is a building for storage of agricultural products so that the temple is known as Stana Dewi Sri. Mrajan Kanginan Temple serve as holy place or stana Ida Mpu Beradah and trusted as mrajan of Sira Manik Angkeran. This temple take place in the north of Kesari Warmadewa meeting hall. 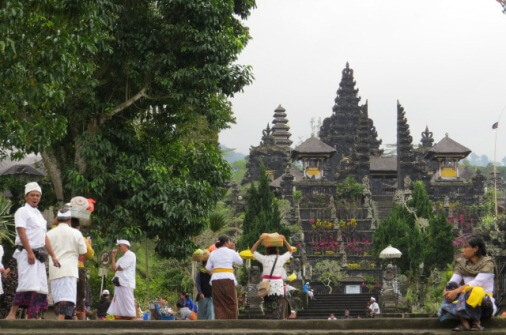 In this temple there is a building serve as Stana Ida Ratu Ayu including garuda statue and hermit sculpture. 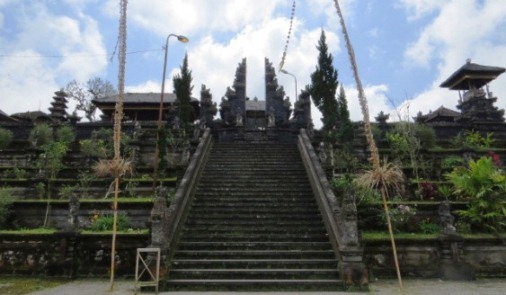 Basukian Temple is located on the right side of the stairs stepped to the Pura Besakih. The main building is a sacred building Meru Tumpang 7 (seven) the stana of Sang Hyang Naga Basuki, which serves as the base of Pura Besakih. Kiduling Kreteg Temple is situated in the southern of Pura Penataran Penataran Agung. The temple is the Stana of Lord Brahma which glorified in the Meru Tumpang 11 (eleven) with the color symbol of red. In this temple is held "Aci Ceremony", a ceremony plead for world happiness and the pest not rampant. on the north side of this place, there is Pura Tirtha Putra. The temple take place on the northern side of the mother temple Besakih. The main building is Meru Tumpang 11 (eleven) serve as Stana of Lord Vishnu which playing the role as a custodian of the world and its contents. The ceremony in Batu Madeg Temple is primarily intended to plead for prosperity through the water as the power of Lord Vishnu with the black color symbol. This temple is located on the eastern side of Pura Penataran Agung Besakih. This is the temple for Lord Iswara glorified in Meru Tumpang 3 (three), as a symbol of purity ruler with a white symbol. In addition to the above functions, Pura Gelap is also serve as a sacred place for the priest (plead to the holy light) in order to obtain a bright inner spirit to perform swadharma. 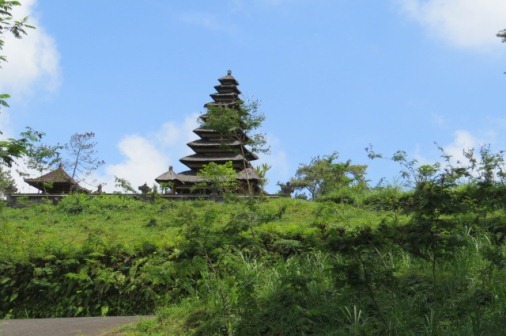 The temple is situated on the top far-enough from Pura Penataran Agung Beaskih, serves as a holy place for Ida Batara Gunung Agung. In Pengubengan Temple there is a main building Meru Tumpang 11 (eleven). Batu Tirtha Temple is located at the southeast of Pengubengan Temple on the banks of a small river. This temple serves as a holy place to plead for tirtha (holy water source) when the ceremonies is held in Pura Agung Besakih. There is a building stana Ida Lord Bale Papelik Tirtha and place offerings. This temple take place in the north of The Main Temple Pura Besakih. At this temple there is a sacred building Meru Tumpang 11 (eleven) the stana of Mpu Kuturan. Batu Peninjoan Temple serve as a holy place to plead Ida Batara to witness the ceremony which will be held in the Pura Agung Besakih. On the northeast, there is Pura Ratu Dukuh, and the river there is a holy water source called Tirtha Lama. Besakih Temple location is close from Kintamani and Lake Batur. From Batur you can continue the trip through Jalan Batur Tengah after the volcanology museum about 20 Kilometers or 30 minutes. Located in Rendang area, Besakih Bali mother temple is influenced by Very Wet Region Climate (A type climate based on Schmidt-Ferguson climate classification maps). The type of climate around here has a humid season start from November continues until July (9 months). The maximum temperature is 32,3 Degrees Celsius and minimum 22,5 Degrees Celsius. The humidity is between 65, 5% - 87,3%. Located at an altitude of almost 1.000 meters above sea level up the side of Mount Agung, Besakih temple complex is also influenced by the coolness mountain temperature. 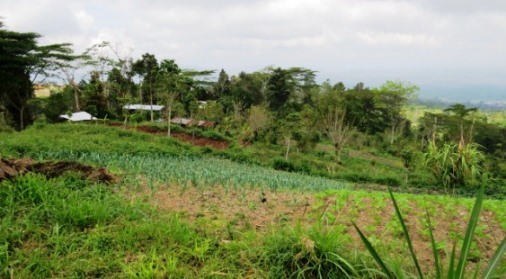 The soil in this area is very fertile which derived from volcanic soils of Agung Volcanics. The fertile soil combine with long rainy season and coolness temperature make the area around the temples is suitable for agricultural such as fruits and vegetables. However, agricultural development is limited related to the presence of The Forest Protected Areas Mount Abang-Agung (Kawasan Hutan Lindung Gunung Abang-Agung). This holy temple had been nominated as a UNESCO World Heritage Site as early as 1990, but remains unvested because of controversies and several reason. The mother temple of Besakih history is mentioned by the ancient manuscript and several inscription. Some of them include The Babad Gunung Agung, The Journey of Rsi Markandeya (Markandeya Purana), Penempahan Inscription, Belanjong Inscription, Malat Gede Inscription, Bredah Inscription (Raja Purana Besakih), and Gaduh Sakti Inscription. The history of Besakih Temple which is located at the slope of Mount Agung is inseparable from the history of the great mountain itself. Babad Gunung Agung is mentioned about the presence of this highest mountain which experienced the eruption several times that gives impact on Pura Besakih. First. The manuscript of Babad Gunung Agung which shows year in Caka "Candra Sangkala Rudhira Bumi (year 11 Caka or 89 AD) mentioned the Mount Agung erupted. Second. The manuscript shows year in Caka "Candra Sangkala Gni Budhara" (year 13 Caka or 91 AD) mention the great eruption of Mount Agung for 2 months during the day and night. At this time Hyang Putran Jaya, Hyang Gni Jaya and Hyang Danuh down to Bali. Hyang Hyang Putran Jaya as Mahadeva glorified at the summit of Mount Agung as Ciwa. Hyang Gni Jaya glorified in Puncak Gunung Lempuyang as Iswara and Hyang Danuh glorified in Mount and Lake Batur as Vishnu. Third. It mention the eruption on Sukra Pon wuku Tolu Sasih Kelima, shows year 70 Caka or 148 AD and there the Salodaka (sulfur water) is formed in the crater of Mount Agung. Salodaka is considered has a magical power by people in Bali and used at a great ceremony. Fourth. Mentioned in the year 111 Saka or 189 AD showed by Caka "Candra Sangkala Çasih Wak Wak" (year 111 Caka) the Mount Agung erupted again. Fifth. Mention the Mount Agung erupted in 1885 Saka or 1963. On 18 March 1963 the great ceremony Eka Dasa Ludra is being held in Besakih. This manuscript mentions about Pura Besakih history which related to holy sage who came from India and lived in Mount Rawung named Rsi Markandeya . He was meditating in Mount Demulung then to Mount Hyang (Dieng) until he got a whisper to open the forest in Bali Island. The first mission, he led 8.000 peoples. Arriving in Bali, he immediately ordered to cut the tree and open the forest. The first mission is failed, his followers got bad luck and died. Seeing this, Rsi Markandeya became sad and decided to return to Java with the rest of his followers. He returned to meditate and eventually guided by God to perform the ceremony before doing the activity to open the forest. He returned again to Bali, but only brought 4.000 people also includes other sages. Arriving back in Bali with other Priest and Rsi, he continues to implementing the God Guidance and preparing the ceremony. After completing the ceremony, all his people were ordered to open the wilderness forest. By the will of God's permission, the activity to open the forest was succesfull, no trouble comes and the people are safe. After quite spacious, Rsi Markandya ordered the people to stop the forest opening activity. Yoghi Markandya then distribute the land to his followers to be irrigated, farm land, as well as the yard of their house. At the former location, Rsi Markandya planting a pitcher (Carat) which contained 5 types of metals such as gold, silver, copper, bronze and iron, which are called "Panca Datu" and Mirahadi gems (ruby major) with accompanied by ceremony and sprinkled by "Tirta Pangentas" (holy water). The location is called "Basuki" which mean "safe" and then the small temple is builded. Furthermore the small temple is developed into the wider temple named Basukihan Temple. The Besukihan Temple is the forerunner of the founding of others temples at Pura Besakih. 3. Penempahan Inscription, Blanjong Inscription and Malat Gede Inscription. Besakih temple history is mentioned on the ancient inscriptions such as Penempahan Inscription, Blanjong Inscription and Malat Gede Inscription. All these inscriptione were written in Phalguna, 835 Saka or February 913. The inscription mentions the name of a king namely "Kesari Warmadewa" which ruled in Singhadwala. The King is believed to be the "Shri Wira Dalem Kesari" or "Kesari Warmadewa" who founded the palace in the Besakih named Singhadwala or Singhamandawa. The place to glorified the King Kesari is named "Merajan Selonding". Shri Kesari Warmadewa ruled in Bali in 882 AD until 914 AD. 4. Bredah Insription (Raja Purana Besakih) and Gaduh Sakti Inscription. The history of Besakih temple is also mentioned in two inscriptions namely Bredah Inscription which is stored in Merajan Selonding (known as Lontar Raja Purana Besakih) and Gaduh Sakti Inscription (in Selat Village). The two inscription are writen in the caka year "Candra Sangkala Nawa Sangapit Lawang" and "Candra Sangkala Lawang Apit Lawang" which show the year 929 Saka or 1007 AD during the reign of King Udayani Warmadewa. Pura Besakih symbolize the grandeur of Mother Temple. Since its inception, this amazing temple has been witness the development of the Ancient Balinese culture and still preserve the history to the present. Besides, Besakih mother temple also occupies the most important position in every ceremony on Bali island. Truly rich in history and culture, magnificent and worth visiting! Get your stuff and take your time to travel to Besakih Temple Bali, hopefully helpful and thank you. 1. Pura Ulun Danu Bratan.